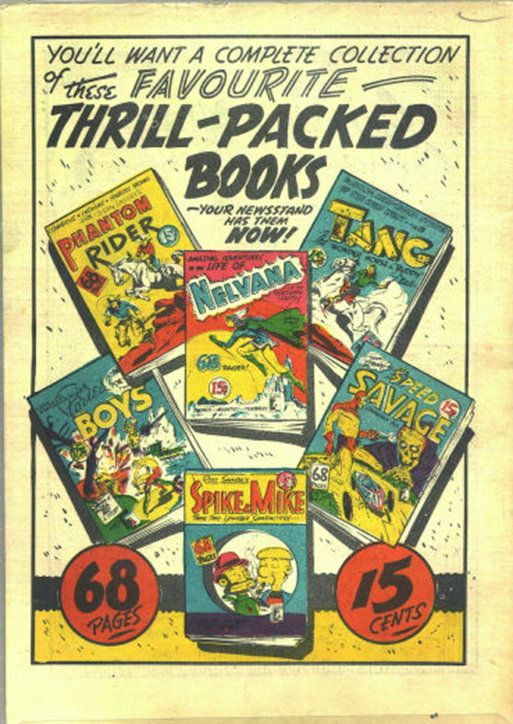 Just like my last post, I am still mulling over ways to acknowledge and publicize 2016 as the 75th anniversary of the Canadian comic book (Better Comics V. 1 N. 1). I hope that my book on Bell Features artists (which should be out at the end of November) will partly contribute to this and I’ll use this column to share any developments. Roy Thomas has also accepted an article I wrote on The Canadian Whites to commemorate the 75th for publication in Alter Ego this year. 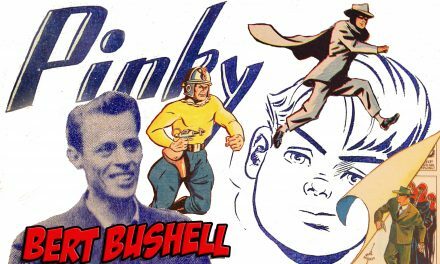 Personally, I think that a great way to commemorate this special year is to put together a set of collectors cards that feature the heroic characters from those Canadian war-time comics. Perhaps the set should be expanded to feature all the main Canadian comic heroes up to the present. First three cards in the set. Cards 4-6 in the set. In 1991, I was approached by the managers responsible for the National Archives’ Canadian Museum of Caricature (devoted primarily to political cartooning) and asked to curate a show exploring the history of Canadian comics. Initially, the exhibition was conceived as a showcase for the Archives’ holdings of Bell Features material; however, I proposed a different approach that would draw not only on the Archives’ holdings, but my own collection and material still in the hands of various artists and publishers. 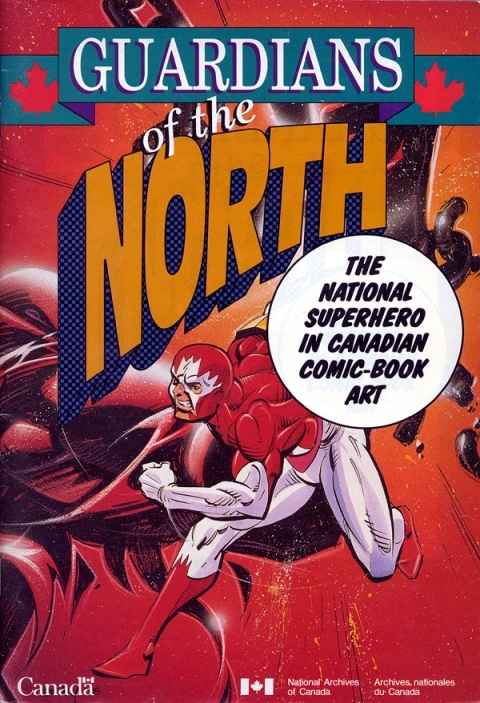 This way, the resulting exhibition, Guardians of the North: The National Superhero in Canadian Comic-Book Art, served as an effective acquisition vehicle for the Archives, as many of the people who loaned material for the show later chose to donate. Once I had completed my basic curatorial work, I was asked to provide some suggestions regarding promotional materials. For a catalogue, I recommended that we adopt a comic-book format. 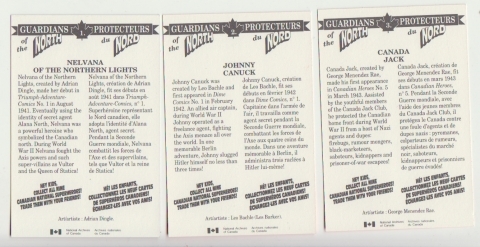 The week Guardians of the North opened, an Ottawa-based journalist who contributed to both the International Herald Tribune and the Washington Post gave the show a very positive review (he was dumbfounded to learn that there were Canadian superheroes). This piece also ran in several other US papers and quickly prompted a major response in the Canadian media (Peter Gzowski, Arthur Black, Mike Duffy, Toronto Star, etc.). 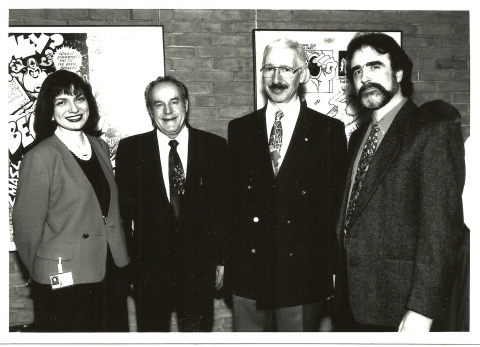 Here is a picture taken on the opening day of the Exhibition in 1992. L to R: Lilly Koltun (Director of the Canadian Museum of Caricature), Les Barker, Jean-Pierre Wallot (National Archivist), John Bell (exhibition curator). A year or so after the show ended, I was approached by Canada Post and asked to assist with their popular Canadian Superheroes stamp issue, which appeared in 1995. I helped with the selection of superheroes and provided the text for the accompanying booklet. This, then, was a small and limited set of cards that now seems hard to find. Should be able to put out a new set (I was thinking of a basic set that showed a colour picture of the hero with a reference to that hero’s creator/chief artist, powers, and first appearance—all this in English and French) what should the scope of it be. Should we include those Canadian heroes from the 70s to the present? How many cards should be in the set? Should we include special limited insert cards (eg., photos of the artists, signed cards by the artists for more modern heroes, an enhanced card—3D, embossed, laser?). How many cards to a pack? And so on…. It could be a grand and memorable set. What do you think? The other thing I’ve talked about as a project for the 75th is some sort of a price guide for the Canadian war-time books. This would have to be a slim, almost pamphlet type of soft cover with just 750-800 entries (so don’t think of the thick Bible that Overstreet is). But apart from the values in a checklist type format what should that booklet contain. Should it have articles and a cover gallery and what should the price point be ($9.99?) that is, what do you think that collectors would be prepared to shell out for it? How often should this guide be updated (every year, every couple of years)? Until we get more data and sales, I think that the grading spectrum listed in the guide start at 1.0 and progress up though 2.0, 4.0, 6.0, and 8.0 leaving out higher grades because they need to be established with higher grade books coming on the market. Most WECA books found and available are at or below VG (4.0) so that what should be considered a high-grade book for these comics would be 7.0 and up. Also most WECA books are Gerber 7 and up, especially in higher grades. But the bottom line would be that this first price guide should be seen as a starting point that can be refined over the years. We certainly do need a starting point because we’ve had nothing really up till now. At the very least, the price guide would serve as a checklist for all known WECA comics and this too has never been attempted before. I hope that the little group of us working on this can pull it off with all the pioneering spirit it involves. 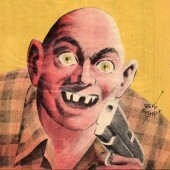 The other thing that could certainly be done is to make this year’s Canadian cons aware of the fact that this is the 75th anniversary of the Canadian comic book so that they can perhaps promote it in some small way by having a logo on their posters and special edition comics that indicates this special year. They could also consider having a panel or two on the topic itself within their event schedule. Of all these things I can report that Chapterhouse is going to bring my book on Bell Features artists with original art page reproductions out at the end of November in an edition of 500 hardbound copies with a price point of $120-140. A kickstarter for the book is planned in September and a limited set of collector cards is planned to be one of the Kickstarter premiums. A cheaper, softcover version will follow a year or so later. 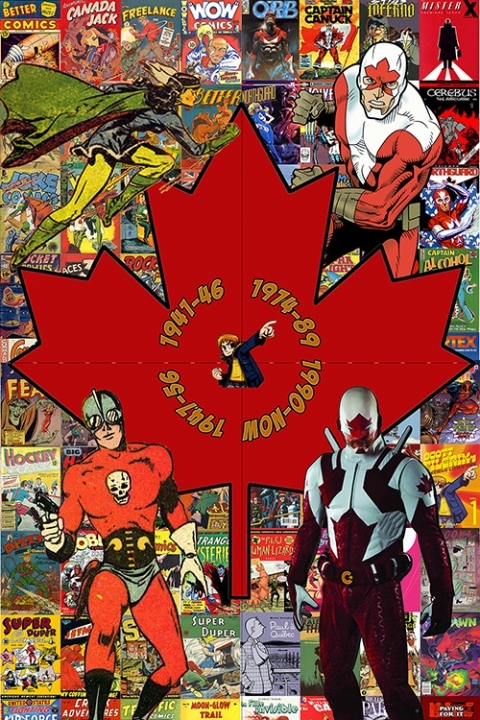 Chapterhouse is also going to employ a “Canadian Comics 75 Years” logo on all their publications issued this year much as the 40 years of Captain Canuck logo was used last year. Chapterhouse is also going to publish a WECA comics price-guide this year and myself, Walter Durajlija, Jim Finlay, and Tony Andrews are working on this right now. If you go through the sections for this first issue you’ll find an informative article on the Bell Features collection put together by the person in charge of it, Meaghan Scanlon. Speaking of the Library and Archives of Canada, I must also draw your attention to a podcast on their site from the end of last May which involves a discussion with Hope Nicholson and Rachel Richey about their recent reprint work. So what small efforts could we make not to let this significant year go by unnoticed and unrecognized? Look at what the Canadian mint did with the 75th anniversary of Superman, whose slender connection to Canada is his birth and childhood in Toronto. Admittedly, Superman’s footprint in the comic world is a little larger in the comic book world and the world as a whole, but these 700-800 comic books that Canada put out during the Second World War are truly and 100% our own. Shouldn’t we have a little bit of a party for them and those we have put out since? You’re on the team that will make some of this happen, Tony. Thanks and let’s make this a memorable year. Thanks for the offer, Rob. Right now we are thinking that the kickstarter will run in August or September (just in time to pick up a great Christmas gift for yourself or a friend). Keep watching these pages for more info. as things develop. I am in like Flynn! You should reach out to all the indie creators of Canadian comics and see about getting them on board too! Personally I am planning to debut a Canadian based hero this year and would be all to happy to include the 75th logo on anything that I do publish this year. I also am teaching with comics in the classroom and this anniversary is a great piece I can add to my lessons. This is the kind of enthusiasm that is needed, Jeff. Thanks for chiming in and great news about your creation of a new Canadian based hero this year. Hope you can let us know more about this in the future. The 75th logo was created by Chapterhouse but maybe we can talk to them about letting it be used by other publishers. 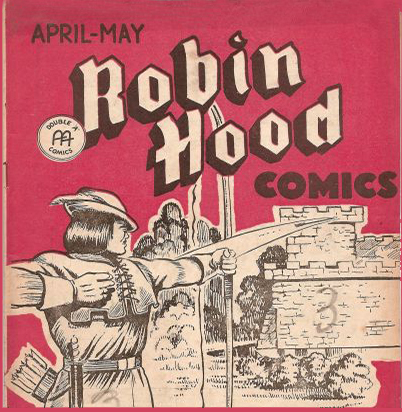 It’s pretty generic and could easily roost on the cover of any comic related publication. Great also to hear from more people who are teaching and using comics in the classroom. I used them a good number of times during my own high school teaching career. I would like to see most of these characters in a new series, maybe crossover with captain canuck and possibly create an expanded universe from that. I may have implied or mentioned my interest in having these characters back into print with a new series. My reason for that is I feel that there is potential with these characters, i.e. for Nelvana, the premise of a genuine god in a sci-fi oriented story or setting is intriguing for me just to see how godhood works in that setting. Johnny Canuck has the escapism of being a globe trotting adventurer, Mr.Monster being has the coolness of being a monster hunter, Polka-dot Pirate sounds like a good name for a light hearted comic, and I really want to see Brok Windsor have an ending. These are a bunch of good characters with good ideas attached to them, and I would buy the book they’d be introduced in if that happens. What do you think? maybe an annual with the new Captain Canuck series? Your ideas are not unique, Alex. Look for things to happen this year and next, Canada’s Sesquicentennial, in the Capt. Canuck multiverse that Chapterhouse is creating. Now you have my hopes and expectations up.. Introducing them through Captain Canuck would make sense since he’s more known, You could make Tom and Johnny alternate universe counterparts or make Johnny like Uncle Sam from the DCU and have both of them meet and have an exploration with the captain geographic trope. I’m in favor of introducing these characters into the new Captain Canuck series mainly to see how they can work in the modern era, make that world bigger and have them join Equilibrium to have a Canadian justice league with guys like Nitro and Dr. Blue serving a support forensic role. And my last point, alternate universe/elsewords that could be done: pulp/golden age throwback work, several historical fiction world focused on Canadian history, a YA novel universe, A manga like world that utilizes the tropes found there, a fantastic Americana dimension, a wuxia based world, an 80’s cartoon world and at least some kind of future world. Can we please leave Captain Canuck out of the 75th anniversary celebrations? I think the character worms his way into enough venues without pairing him up with any of the truly great characters from our Golden Age. I understand what your saying Mel, it’s their year after all. I think for some of us, including me, we want to see a crossover with our homegrown heroes, eventually. I’ve though of an alternative within yesterday: do something like DC’s earth one series, it would reintroduce the characters in whichever time period written and the graphic novel format would allow for a complete and possibly chaptered stories since they had a serial format feel.